In case I haven’t already mentioned, I’ve always been a sucker for cookbooks. Even before switching to a vegan diet, I had a tendency to pick up collections of recipes. It never mattered that my family already owns more cookbooks than we know what to do with. Now that vegan food is a staple in our household, I’ve been trying to gather both traditional and unique recipes to try. This has led to a growing collection of exclusively vegan cookbooks. But even with a shelf full of options, my books occasionally let me down. Such was the case yesterday. I got up knowing that I wanted dinner to contain black beans and quinoa, but for the life of me couldn’t find a recipe that matched the sort of dish I was picturing. It’s been a while since I invented something from the ground up, so I decided to take a crack at it. This was the result! 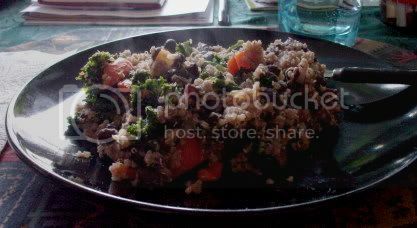 Black beans, quinoa, and fresh kale, together with some cilantro and lime juice to season it all up. It was an instant family hit (thankfully! ), and I’m glad it came out well enough to be able to share the recipe. 1) Rinse the quinoa and place it in a pot with the water or broth. Bring it to a boil, then reduce the heat and cook until the liquid is absorbed, about 20 minutes. 2) While the quinoa is cooking, heat the oil in a large saute pan over medium heat. Add the garlic and chilis and cook until fragrant, about 30 seconds. Add the onions and pepper, cover and cook until tender, about 5 minutes. 3) Add the beans, cilantro, cumin, and lime juice and pepper to taste. Add as much of the reserved bean liquid as you wish to make the whole thing moist, but not too watery. Reduce the heat to medium-low, cover and simmer until the quinoa is done. 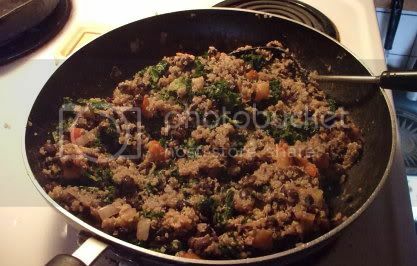 4) Once the quinoa is cooked, uncover the bean mixture and add the kale. Cook until just wilted, then stir in the tomatoes. Add the cooked quinoa and stir until everything is well combined and heated through. Taste and adjust seasonings. Serve hot. Drizzle with tamari, if desired. How saucy and seasoned to make this is largely up to personal preference, so play around with it to find the flavor you like best!